Teaching math doesn't need to be hard with the easy-to-use Horizons 4th Grade Math Teacher's Guide. Complimenting lessons in Horizons 4th Grade Math Student Books 1 and 2, this practical Teacher's Guide contains step-by-step daily lesson plans with teaching tips and learning activities. This Alpha Omega curriculum guide includes tests, worksheets, and answer keys. Looking for a teacher's guide that makes teaching math easy? Look no further! 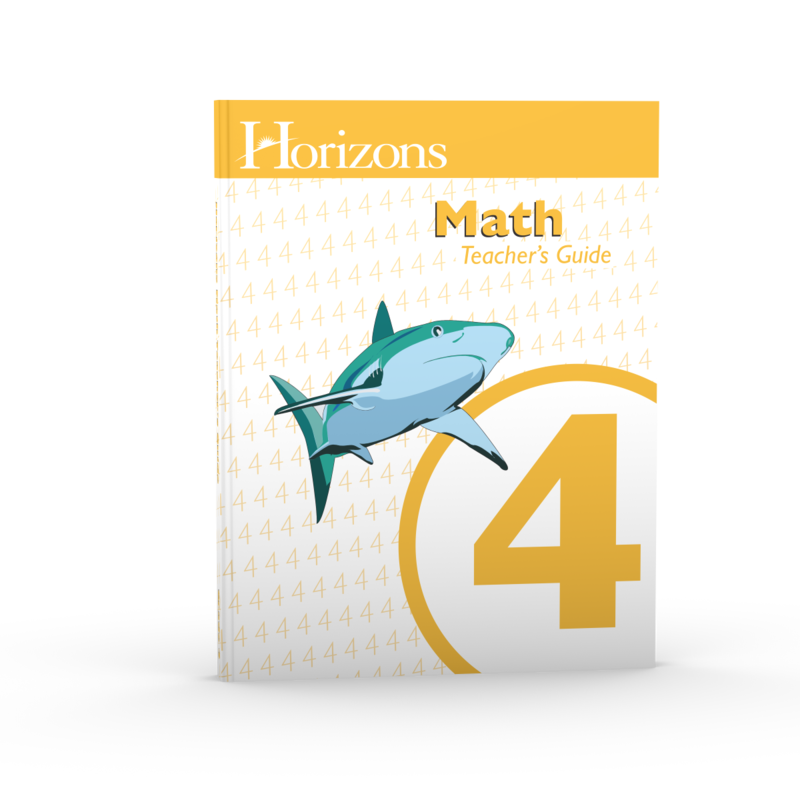 Discover the comprehensive, easy-to-use Horizons 4th Grade Math Teacher's Guide from Alpha Omega Publications. More than just answer keys or a brief overview, this time-saving Teacher's Guide for the Horizons 4th Grade Math Student Books 1 and 2 curriculum clearly outlines 160 daily homeschool lessons plans. Not only does this invaluable Teacher's Guide contain specific goals, teaching tips, required supplies, and suggested learning activities for teaching elementary math, you'll also find a detailed scope and sequence, manipulative schedule, and additional worksheet schedule that makes lesson planning a breeze. But wait, there's more! The Horizons 4th Grade Math Teacher's Guide also includes a math readiness evaluation test to help you determine your child's strengths and weakness even before you begin teaching. Imagine how helpful that information will be when planning homeschooling lessons for the year! Plus four unit tests after each series of 40 lessons will help you determine if your child is grasping the 4th grade math concepts he needs to know in this Alpha Omega curriculum. Sound great? It is! Eliminate your teaching insecurities. Order your Horizons 4th Grade Math Teacher's Guide today!